Today, I had one of those moments when you find something that you had no idea existed (and therefore had no idea you needed it) and then decide you needed it within a minute of its discovery. The Nabaztag is a smart little bunny that can keep you up to date and informed. So you are probably wondering if a rabbit can really be “smart”? Well this bunny can teach you tai chi, read your e-mail, report the weather or stock market, pull RSS feeds and tell you the time. We’d say that’s pretty smart - but he’s also got personality. 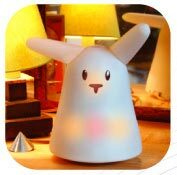 Nabaztag can move his ears, play music, talk and whistle, and his body can show off hundreds of colors and special patterns of light. Sometimes he will even have his own random things to say, as long as you can put up with his moods! At a price of $150, how can you go wrong? They’re currently taking pre-orders that will begin shipping May 16th. These cute rabbits can even marry one another. Need I say more? I don’t think so, but I should mention that it can be configured with a web browser, meaning Mac users won’t be locked out of the fun.